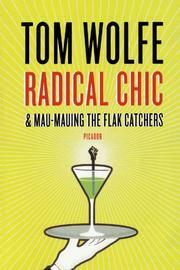 The Kandy-Kolored gossip is with us again and, with a poisoned egret feather, Wolfe pinions the "Radical Chic" adventures of Lennie Bernstein and his circle. And in the second piece he presents a scurrilous vision of the conciliatory white (ibid. his humble flak-catcher) routed in a "community" anti-poverty fund program. Wolfe does an elegant hatchet job on Bernstein, "The Great Interrupter, the Village Explainer. . . Mr. Let's Find Out. . . ." Through a very dark glass indeed the famous Bernstein affair for the Panthers is reconstructed. And there are the "delicious" "most intimate nuances of status" involving white servants and the "proper scale" of decoration for the outre presence of the oppressed brothers -- a presence which sends vibrations through well appointed halls like a "rogue hormone." Part II deals with another bizarre confrontation -- Wolfe's forte: an hypothetical "mau-mauing" by a black militant group of a white bureaucratic slob caught in the sticky anti-poverty network. It's wired for noise: " 'Dat's right, Brudda! We be seeing you' Ba-ram-ba-ram-ba-ram 'We coming back!' " Funny, facile, completely irresponsible, a pique performance of a talented mockingbird with, as Murray Kempton recently said of a New York politico, "the social conscience of a cat." Radical Chic appeared in altered form in New York Magazine.